History of our Garden . . .
“My green thumb has always been part of my life”, says Ken McGann, owner. In early childhood, he helped his father tend a large garden. When he decided to plant the suckers off the tomato plants, it was against his Dad’s better judgment. The plants grew and even produced tomatoes. Ken was hooked for life. The love of growing has included raising and selling African violets, vegetables for U-pick, and bedding plants, among others. He also completed a landscape design course. 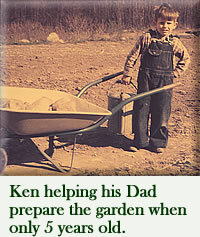 Ken’s experience in nursery work includes 39 years with a nationally known wholesale nursery. Ken and wife, Mary, have been married 50+ years, and have enjoyed the planting, growing and selling together. Their two children remember the huge gardens - and also the weeding that needed to be done! Their family now includes grandchildren and great-grandchildren. Daylilies got into Ken’s blood several years back, when he added some to his own yard. Daylilies are the perfect perennial for the northern climate, since Montanans like to forget about their yards and gardens when summer is over. They go hunting in the fall, and then enjoy snow sports in the winter. Spring brings with it the excitement of planting and working the ground again, hence the name, Spring Fever Daylilies. 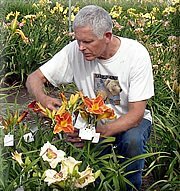 Wanting to expand the interest of those in his local area beyond the common “ditch lily”, Ken began introducing daylilies in newer, hybrid colors, styles and forms. The supply was expanded greatly when he was able to buy a private collection from a longtime acquaintance. “We can provide you with some of the ‘classic oldies’", says Ken, “and also many beautiful, more recent introductions.” We are confident that our daylilies will appeal to you, the homeowner, the collector, or the hybridizer. Ken is very enthused about his daylily hybridizing program. The seedlings have been exciting to watch; several seedling blooms look promising, and he continually looks for that “special one” to register.